It was Sean Ashe who, not only, asked us to do the color but came up with the name. Any ideas from where that inspiration may have come? 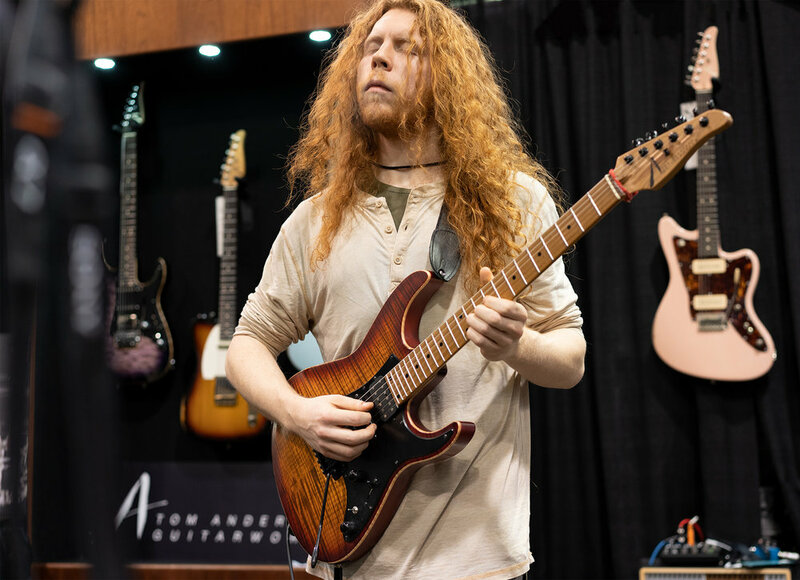 It happened at the NAMM Show. Billy spied Bob from across the Anderson booth. Startled and secretly thrilled, Billy tried to make it look as though he was just nonchalantly wandering in that general direction, but within a few steps he was into a full-out sprint to meet and greet Bob. After all who could blame him? It was his first time to see an Anderson, Bobcat in person. Billy Campbell is the superlative guitarist who plays with the dynamic country duo, Locash and has been featured in Anderson Guitar Tales before with his beloved Guardian Angel slung over his shoulder. Like an Angelic gift, a Bobcat appeared right before his eyes in Natural Mocha Burst, offering him more magical musical opportunities. The legend…the one-and-only, Tim Pierce stopped by our NAMM Booth to hang out. Always love having him over. And since we know what question you really wanted to ask next: Yes, he is a very nice guy. Fun. He spied this brand new Icon painted Olympic White and as he was picking it up he dinged it—apparently several times—over and over and over. You can see the devastation; paint almost falling off of it, scratched and dinged everywhere. Looks like he had played it for over 40 years. How could Tim, such a nice guy, be so careless with our Icon? This Anderson Icon is In-Distress. Tim didn’t actually ding it at all. Oops, ha…we did. What that means is that this Icon has our In-Distress paint finishing process to make it look super cool and realistically worn and played in. In Distress Level 3-Double Decker—two colors painted atop one another with Level 3 Distressing. In Tim’s hands we have Olympic White over Tobacco Burst. So apparently Tim is not careless after all. He is just a great guy. 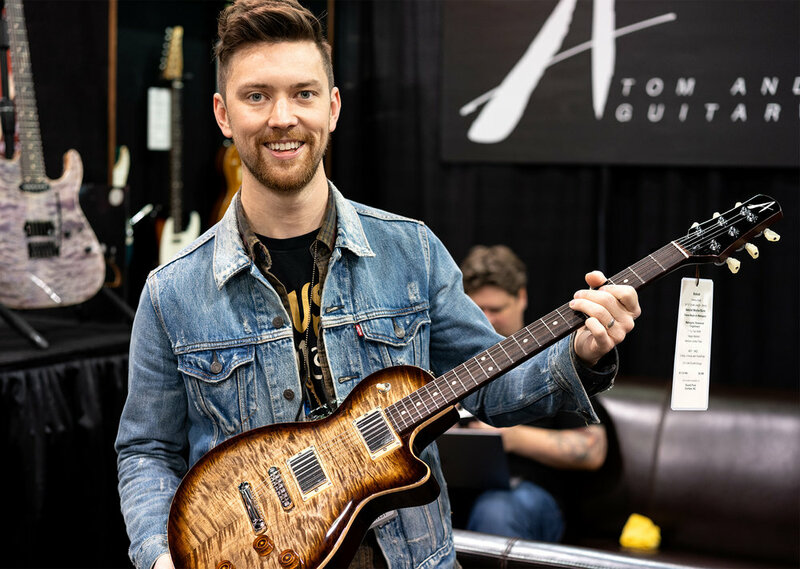 And it is Anderson Guitarworks who is guilty of being carefully and precisely careless—on purpose—for your performance and visual playing pleasures to be fully realized. Is that they are all really great people. Think about it, when someone you know meets a super-famous person what is the first thing you (or almost anyone) will ask? So, we can unequivocally say, Yes, these guys are all super-nice. These are the artists that performed each day at the Anderson booth. The audience could not help but be impressed. It was a spectacular experience. Our heartfelt thanks to all of these astounding artists that cared enough to shared their time and talent with us. Superbird—as it so often seems to be. 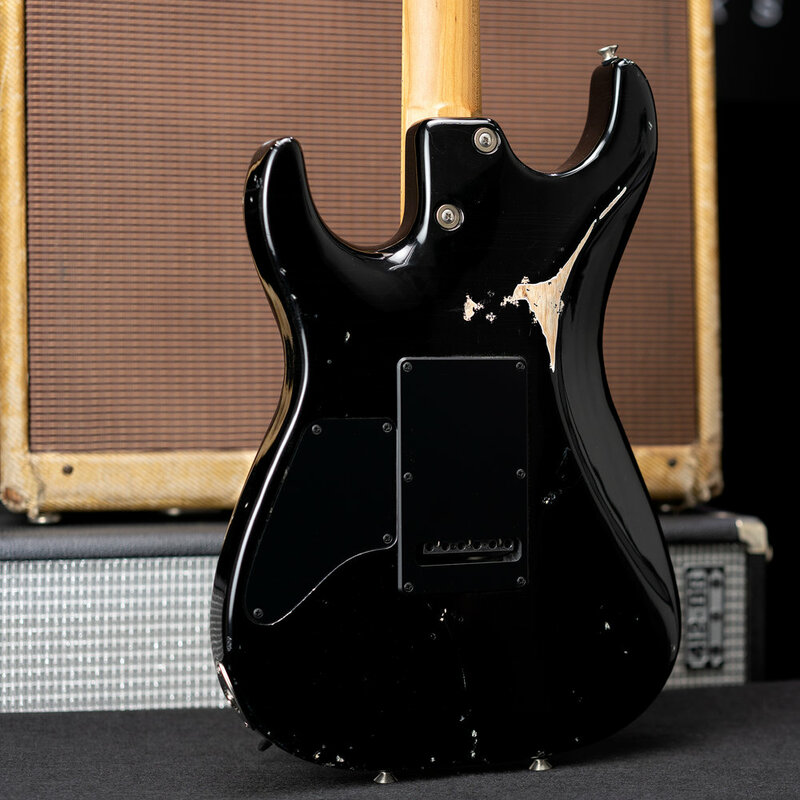 Superbird consistently turns heads at NAMM and perhaps this year more than ever—dressed in Black with White Dog Hair finish, for the very first time ever on an Anderson. It is this “magic” amalgamation that makes Superbird a formidable sonic force—not to mention unparalleled Anderson playability—although everyone mentions it. A crowd gathered as Hannah Wicklund took this Raven Superbird through its paces. They stood totally enraptured, was it Superbird or Hannah…or both? We may never know for sure. What do you think? Quick, look closely at this Drop Top Classic and then zoom in for an even closer look. What you will notice is a sheer dusting of sparkle enlivening the Maui Kazowie Surf finish. This is the same elegant sheen that has stopped everyone in their tracks at the NAMM Show as they stand and gaze upon this Drop Top Classic shimmer and glisten under the lights—subtle and profound. And just so you are aware, we can add this “Sheer” metallic flake to any of our colors. To call this Drop Top Classic’s appearance at the NAMM Show a “show stopping experience” is to not overstate the sheer power of the Sheer. 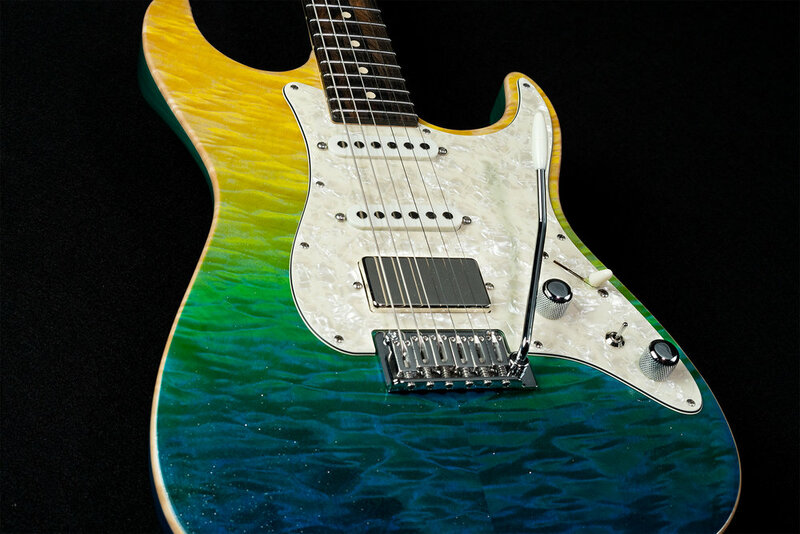 After the Show: Drop Top Classic, Sheer Maui Kazowie Surf headed to Eddie’s Guitars, Maplewood, Missouri. It’s a beautiful thing to have a guardian angel watching over you, in the Anderson NAMM Booth—or any other time for that matter. 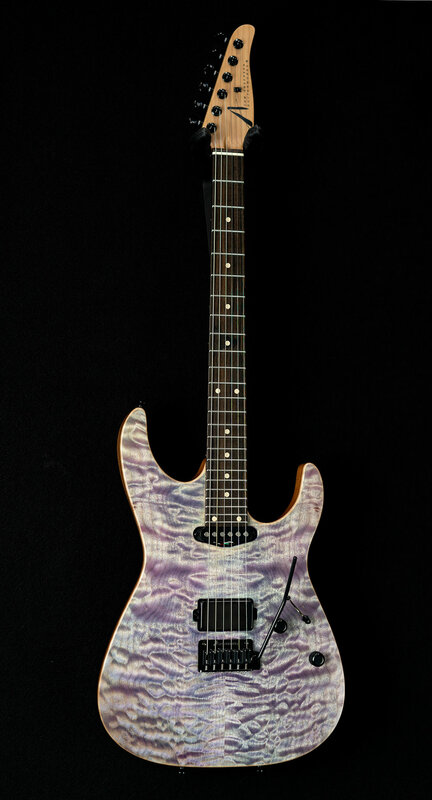 And speaking of beautiful things…how nice is it to complement this Guardian Angel’s Natural Purple to Trans Purple to Black bursted hues with the appointment of a Black Pickguard, entirely lit by chrome hardware highlights and a nickel covered HC2 pickup. All this and an Anderson jet-fast neck and it could be said that with a Guardian Angel on your shoulder your performances will be miraculous. Yes, we are having an angelic time at the Anderson Guitarworks NAMM booth. Then it’s all good as everything easily melds into high performance, virtual vintage bliss. For this one its aged essence is personified as Sonic Blue In-Distress Level 3—one of the most coveted of vintage colors. After the Show: Guardian Angel Player, Sonic Blue - In-Distress Level 3 headed to The Music Zoo, Roslyn, New York. 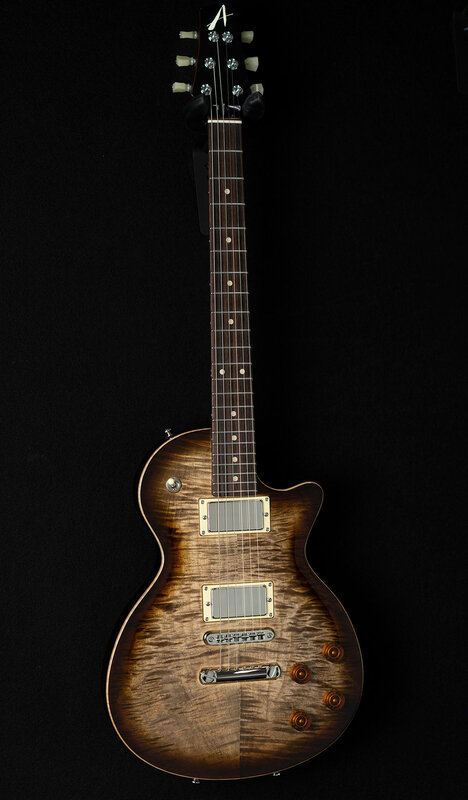 Everyone loves Koa and seems to be moved by its allure. Crowning this Top T is our Figured Koa top highlighted with a finish of Honey Shaded Edge—so it is Natural Koa with a slight contrast of Transparent Honey on the perimeter of the body—gorgeous. 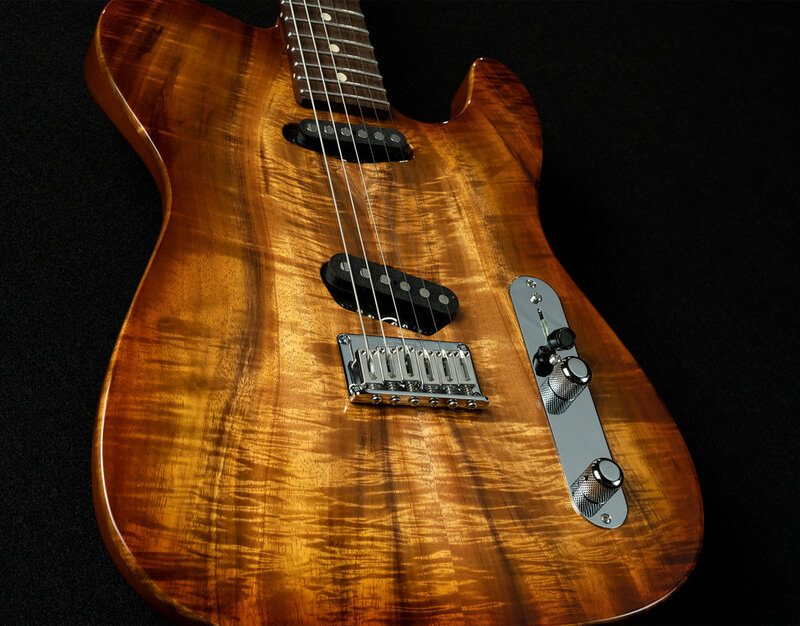 Top T, by its very nature, does not have pickguard styling—no pickguard, all-wood top. 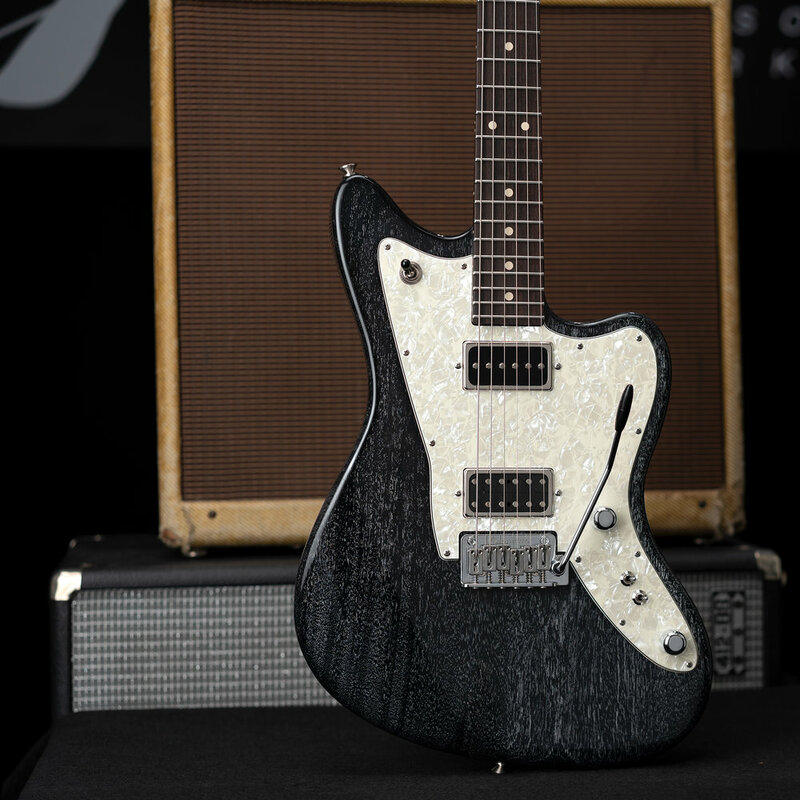 Its cousin, the just previously seen Top T Classic, does have pickguard styling for those that love more vintage flavors. But what this Top T does have is an option borrowed from the Top T Classic that is unique and new. Can you spot it? Top T now has the option of a T-plate for the switching controls. Very nice. Have a closer look. After the Show: Top T, Honey Shaded Edge headed to Cosmo Music, Ontario Canada. Here it is, in case you were wondering. This is the original surf-style paint process—like you are standing on the shore and looking out as the water (and the color) gets deeper. And this was the original color we used to create this theme—Bora Blue Surf—like the waters in Bora Bora. 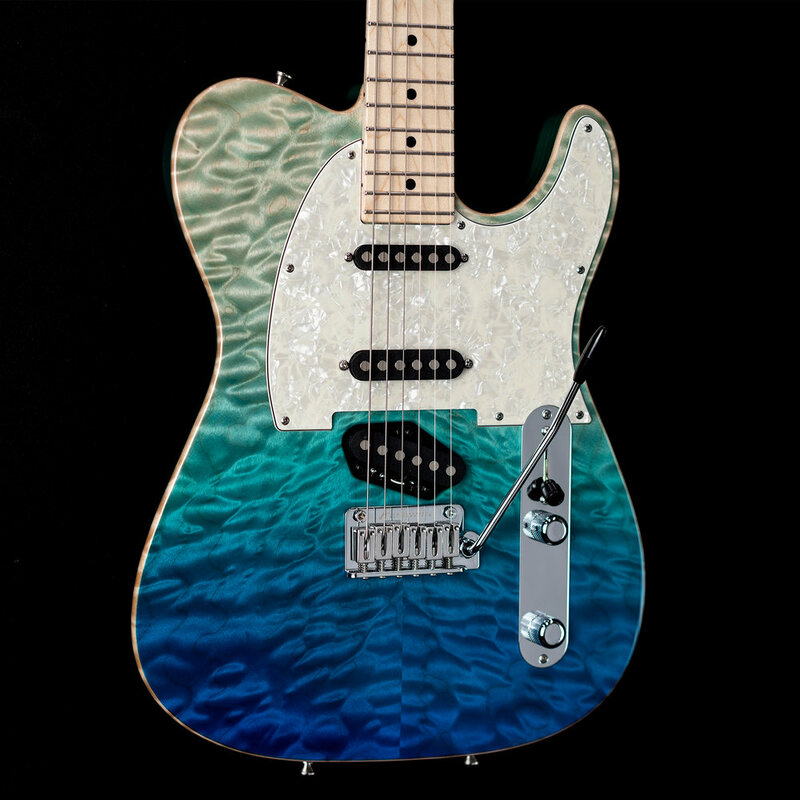 Washing up on the shores of this Top T Classic, Bora Blue Surf accentuates this beautiful guitar’s Quilted Maple Top while its Alder body-back brings lower mid richness and upper mid dominance to the TF1, SF1, TF2, single coil-size pickup configuration. New and fast Anderson 5-Way switching allows both Middle pickup alone or Neck + Bridge pickups in position 3—so T-like when needed. 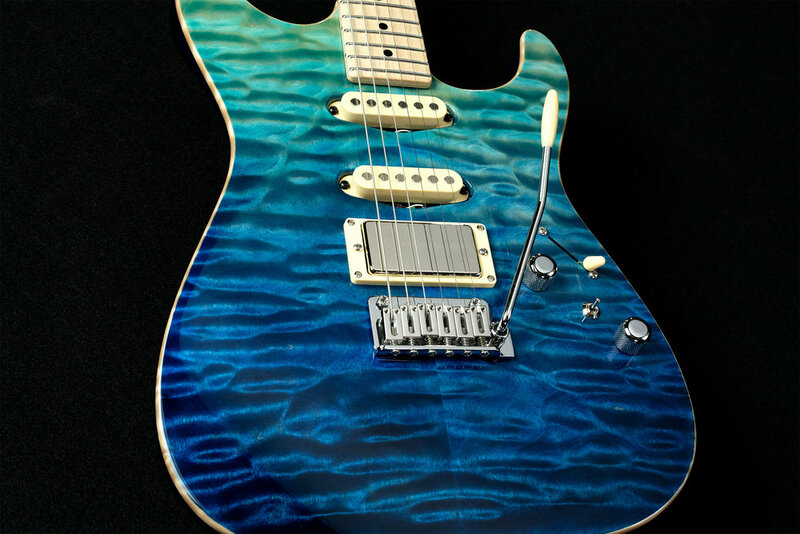 After the Show: Top T Classic, Bora Blue Surf headed to Japan. And when you need your single-cut to have a wonderful vintage look…look no further than Bobcat in Lemon Drop. 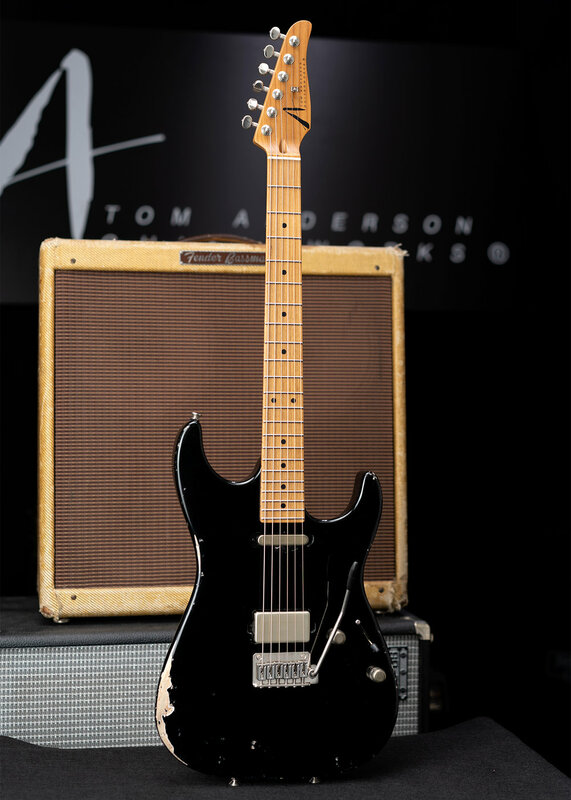 Still silly in-tune stability and resonance with unparalleled Anderson playability. This Bobcat is solid and yet not heavy—but just the right weight for a solid single-cut that you want to play all night long without fatigue. And its tone is…superb…no, beyond superb—a focused and aggressive midrange substance that is interlaced with ultra-rich dynamics that grant gorgeous musical tonalities. So what does this mean? 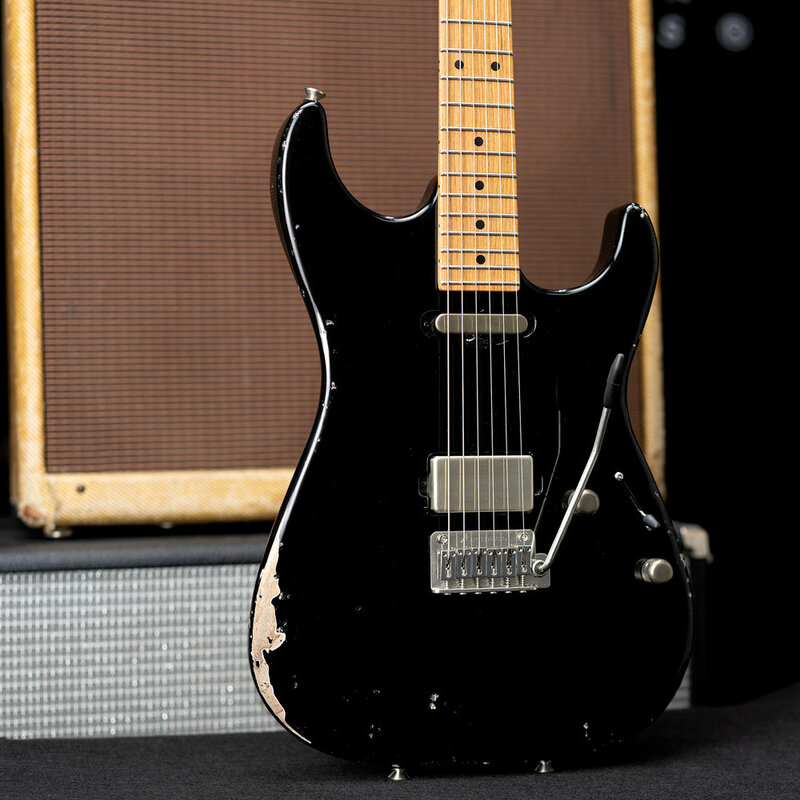 A lush sounding guitar with monstrously aggressive mids. After the Show: Bobcat, Lemon Drop headed to Distinctive Guitar in Milwaukee, Wisconsin. Well no, not exactly. We call it Bobcat. An Anderson single-cut with unparalleled Anderson performance—a super good thing. This Bobcat is dressed up all fancy and ready to gig out in a Natural Mocha Burst finish—bringing its Carved Flame Maple Top to life. 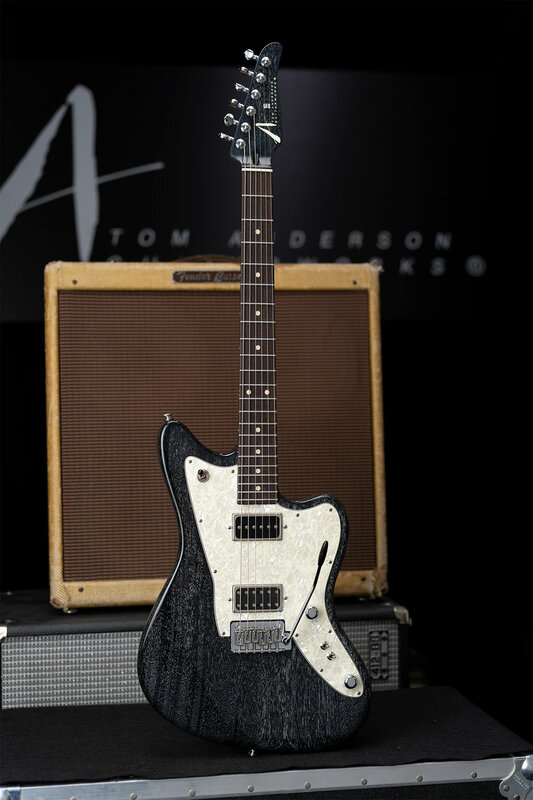 And its in-tune stability is not to be believed—until you touch it—then you will not only believe but know…Bobcat—such an utter joy to play. 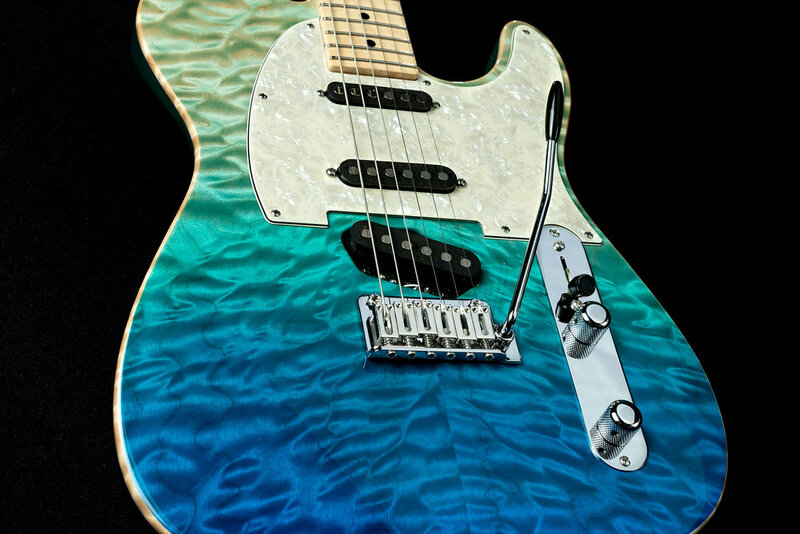 Big 3-Way Toggle on the upper horn controls the twin humbucker pickup configuration but with Push/Pull switches on each tone control, 8 sonic combinations are easily brought forth so you do not have to lay down this guitar when musical styles change throughout the evening. This Bobcat is…hollow. That is correct, hollow chambers hidden beneath the surface makes our already lightweight Bobcat, even lighter—and adds a touch of “air” to the tone—if you are listening closely. Bobcat fact: No single cut is better! After the Show: Bobcat, Natural Mocha Burst headed to Sound Pure in Durham, North Carolina . An In-Distress Level 3 paint job with two layers (two colors) of paint—one underlying the other. Debuting on this Icon Classic as Olympic White over Tobacco Burst. We take great care in making all of our In-Distress finishes—including these new Double Deckers—to capture the real essence and depth of a vintage instrument. Not to make it look like your “disturbed” uncle lit it on fire, through it down the stairs and then jumped on it with baseball cleats. That is not how a real musician treats a time-honored instrument. But instead, with our In-Distress we are capturing the look and feel of real road and playing wear—a coveted and wonderful instrument from the hands of a master that has many years of musical experience and stories to share. Vintage VA7.2 pickups grace the neck and middle positions while an HC2 in an aged nickel cover takes up its position at the bridge. 5-Way Switching with the traditional 3 knob layout and top jack is only the beginning as Push/Push pots on both tone controls grant extra access of a neck + bridge pickup combination and splitting for the humbucker. After the Show: Icon Classic, Olympic White over Tobacco Burst - In-Distress Level 3 Double Decker headed to Lark Guitars in San Antonio, Texas. And let’s just continue with this In-Distress theme for the day? T-Icon is our essential “T” with a traditional 3-saddle bridge—that is compensated for astoundingly excellent intonation. To have a “T” play this good is virtually unbelievable—and oh so nice. T-Icon has been wildly popular with Anderson Players—nice to have one, for sure. T-tones abound. And can it get more “iconic” than a T-Icon finished in 3 Color Burst—especially as In-Distress Level 2? Ah…no, it cannot. So right! And…Anderson vintage coils, TV1 and TV3 controlled by a traditional 3-Way—and a VA Booster hidden as a Push/Pull on the tone control for a bump up when needed. After the Show: T-Icon, 3 Color Burst - In-Distress Level 2 headed to Huber & Breese Music in Fraser, Michigan. Remember what we have been saying? 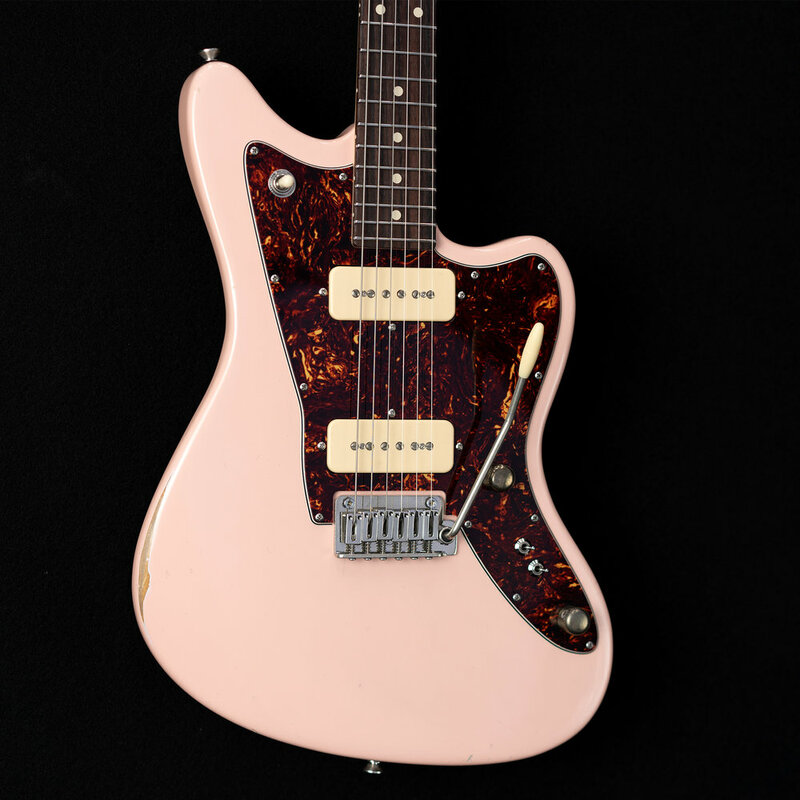 “Pink is the new Black,” and here it is again. 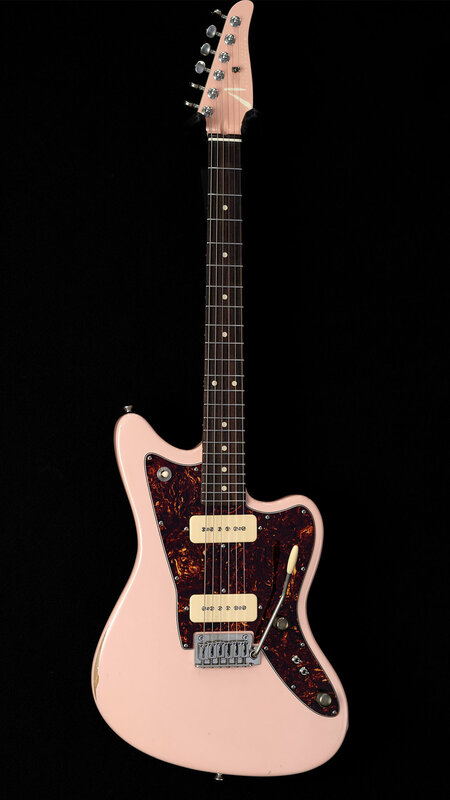 Shell Pink - In Distress Level 2 adorning this Raven’s offset goodness. How can you beat this if you want to make a dynamic statement and still stay true to vintage vibes and hues? 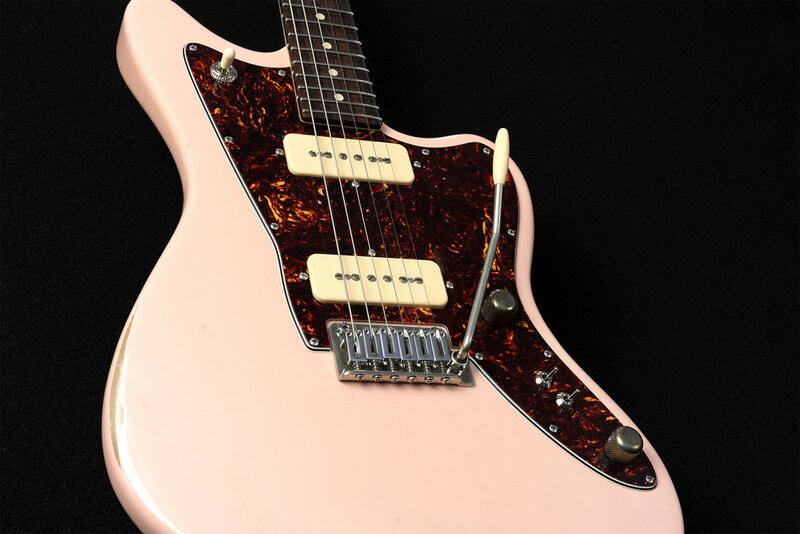 Raven Classic in Shell Pink sounds so good that you may want to mike and record it before you ever plug in. Really fantastic matrix of tonalities before you ever get to the pickups or the amp. Cream covers sequester PQ1 and PQ3, hum-free coils with massive Soapbar-style, single coil tone, while the Big 3-Way Toggle and 2 mini cut switches offer 8 unique tonal flavors—for everything, and more, that you will desire. After the Show: Raven Classic, Shell Pink - In-Distress Level 2 headed to Mass Street Music in Lawrence Kansas. …and if you bump it into the mike stand, so much the better. No stress. It is a Pro Am finished with our In-Distress paint scheme—looks gig-worn. 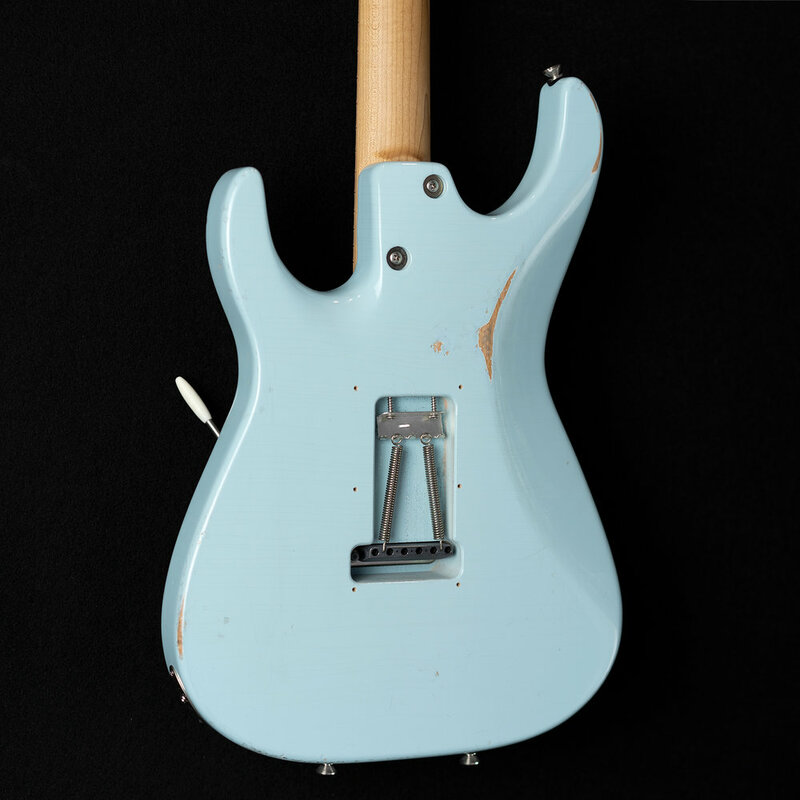 A nitrocellulose finish, it readily checks and cracks—just what In-Distress players desire. 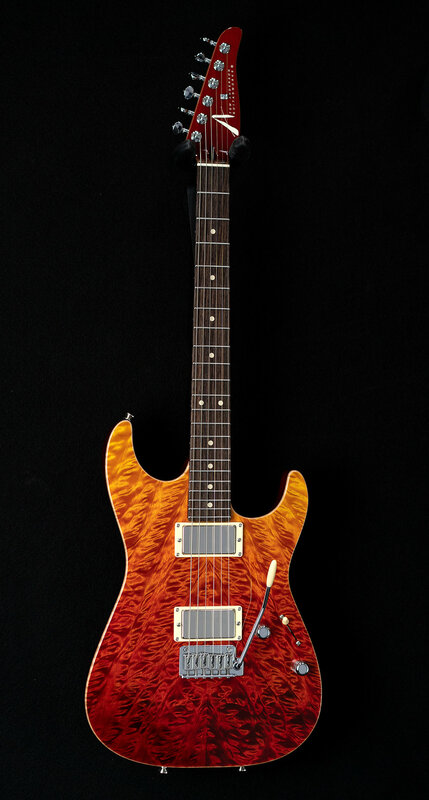 This Pro Am happens to be a short-scale and speaks with a Swamp Ash body and the control of an all-Maple neck. After the Show: Pro Am, Black - In-Distress Level 3 headed to Nashville, Tennessee, Guitar Center. We have long said: if you want to rule the Earth with a guitar—which is a very noble endeavor if you are doing it with music and sharing—Cobra is the way. Cobra S now appearing in Fire Wipeout—yes, another new Wipeout color. Again, look deep into its depths—feel free to zoom in—all the way. 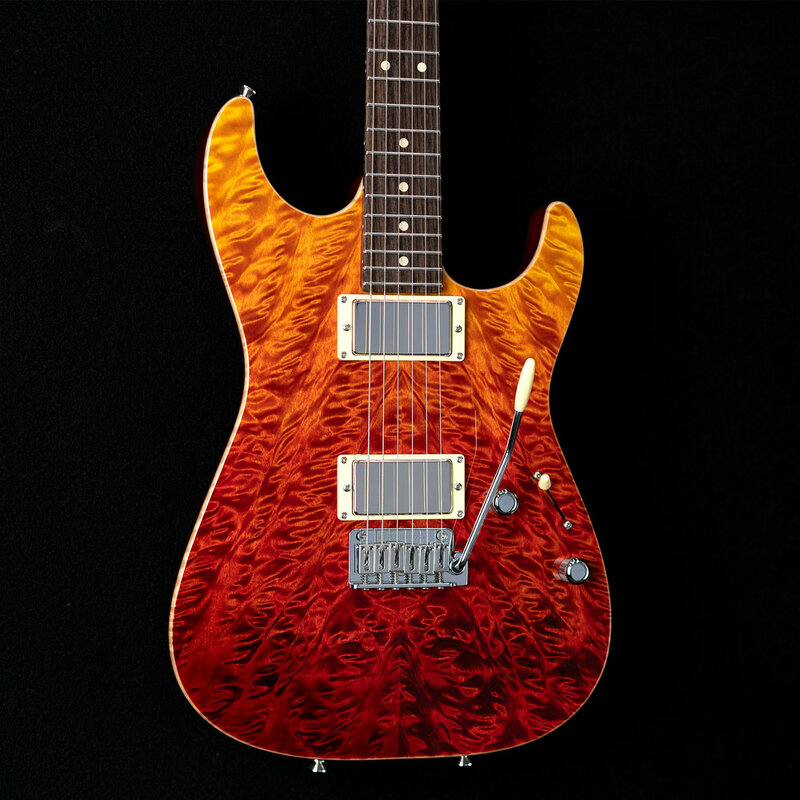 After the Show: Cobra S, Fire Wipeout headed to Northwest Guitars in Bellevue, Washington. The maple topped goodness of Drop Top—undeniable. 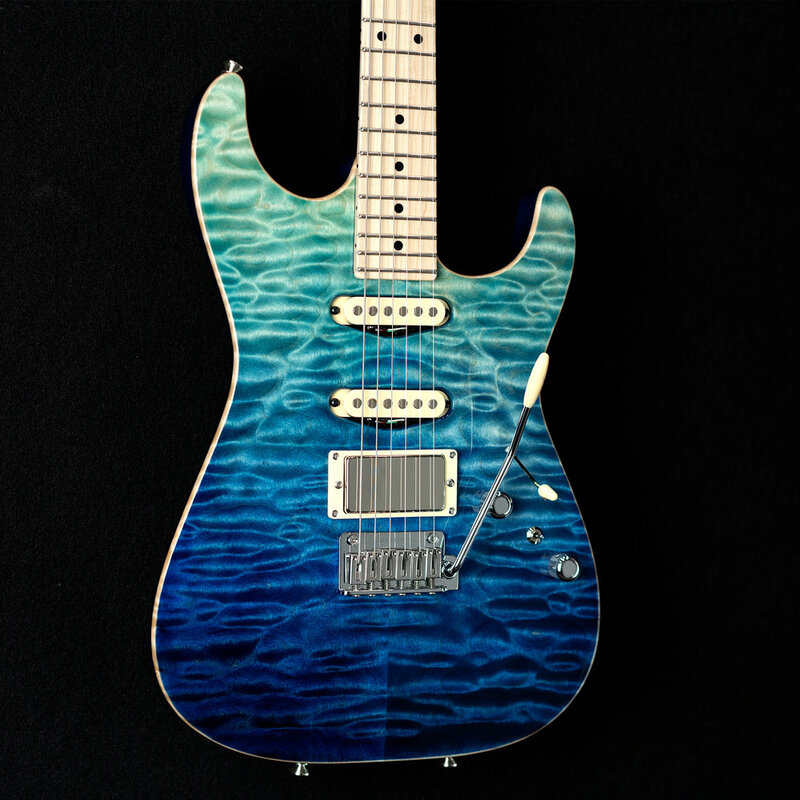 This original Anderson creation is gracing our NAMM booth with Blue Wipeout—an extreme surf-styled color with visible and dramatic grain in the deepest of deep hues. So you could say that Wipeout is another version of our surf-themed paint scheme—available for certain colors. Gaze deeply and feel free to zoom into its depths. An Alder body-back supports it magnificent SC1 single coil sounds and lends low-mid punch to its HC2 humbucker—all controlled by our new, simpler, faster and super versatile 5-Way switching—more on this in a later post. After the Show: Drop Top, Blue Wipeout headed to Northeast Music Center in Dickson City, Pennsylvania. There may be nothing more formidable to take to the gig or into the studio than the all-Mahogany presentation of a Raven…Superbird. It is this combination of wood and format, along with that unparalleled Anderson essence, that makes Superbird so superb to play. 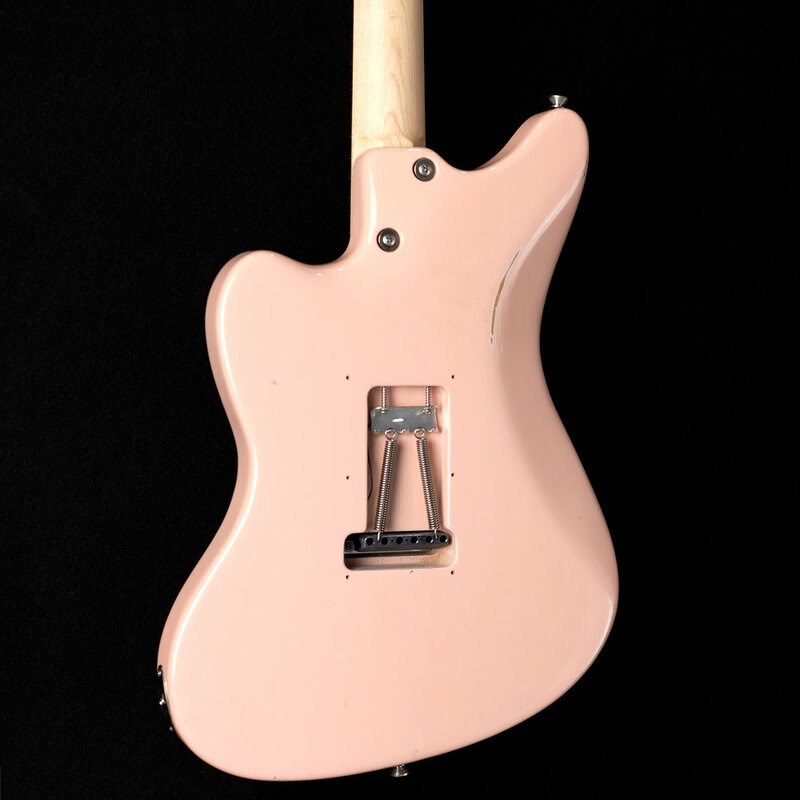 We have long been asked for this color to add finishing touches to our Mahogany bodied guitars and our Paint Department has responded with a Black with White Dog Hair finish for your viewing pleasure. After the Show: Raven Superbird, Black with White Dog Hair headed to Dave’s Guitar Shop in La Crosse, Wisconsin. First up is a color that many have been trying to see in its original form—without a bursted edge color but in its essential form—pure: Abalone. Pictured is Angel finished in Abalone and appointed with Black Hardware—including a Black Covered, HC3 bridge humbucker pickup. A Natural Mahogany body-back adds midrange focus to its sonic presentation and a wonderful woody essence to its look. 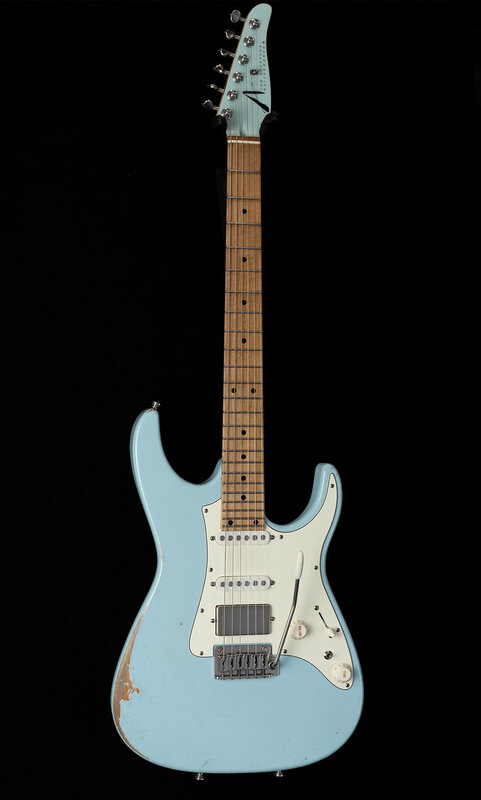 It is the robust SC2 single coil-sized pickup in the neck that willingly takes on all single coil duties delivering single coil brawn and vibrance, while your hands hover above the fingerboard atop stainless steel Jumbo frets—polished precision and playability, glistening under the lights. After the Show: Abalone, Angel headed to Make’n Music in Chicago.